As a coffee buff, what is your worst nightmare? It has to be the day where you wake up all groggy and without a dipper, brewer or any coffee maker to enjoy your daily supply of morning coffee. While it’s ok to have instant coffee for some days in the week, it’s definitely not as gratifying as your regular cup of coffee. You don’t have to be stuck without a coffee making machine forever. There are many ways you can enjoy some delicious coffee without having to use an appliance. 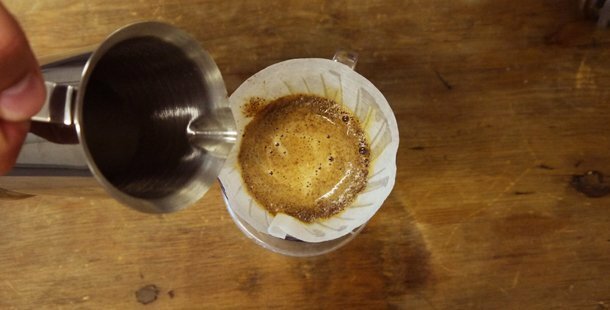 If you find yourself without a coffee maker, there are a few methods to brew your coffee. But before we get to that, here are a few tips to prepare scrumptious coffee without a coffee maker. Choose Freshly Roasted Coffee: It’s as simple as that. Go for decent beans that have been roasted within the past 2 weeks. Use freshly ground coffee: It takes around 15-20 minutes for coffee beans to start losing that goodness which makes them taste heavenly. The Right Water Temperature: The right temperature is important because if you use cold water, you will under-extract your beans, whereas boiling water will scald the beans. The sweet spot lies within 195 -205 degrees. You can bring the water to a boil and let it simmer for 30 seconds. Use a thermometer to check for the right temperature. People who have some handy kitchen tools to brew up a cup, usually opt for this method. Pour some water into a saucepan. Remember to use water more than the desired quantity of coffee since you will lose some part of it because of soaking and boiling. Blend the coffee so it mixes well with water. It is best to opt for the same quantity you normally put in the coffee making machine. Set your burner to medium to bring the coffee to a boil. Make sure you stir occasionally so no grounds get burnt on the bottom of your pan. Don’t cover the pan and let your coffee boil for a couple of minutes. Turn off the stove and allow it to cool down for a few minutes as the grounds rest on the bottom. Use a small ladle to pour the coffee into the mug, but make sure no grounds come with it. In case you can’t use a ladle, you can also pour your coffee directly from the pan. Another popular technique is the strainer method. Coffee lovers who have a broken coffee maker or who don’t have a filter can avoid a trip to the supermarket if they have a strainer. However, a regular strainer is less likely to make the best coffee. The ideal strainer is a double layer mesh strainer which has small holes to take care of all coffee grounds. Use the right amount of water for the number of cups you want to make. Pour this amount of water into a kettle or a saucepan. Use your preferred amount of coffee grounds for the number of cups you are brewing. 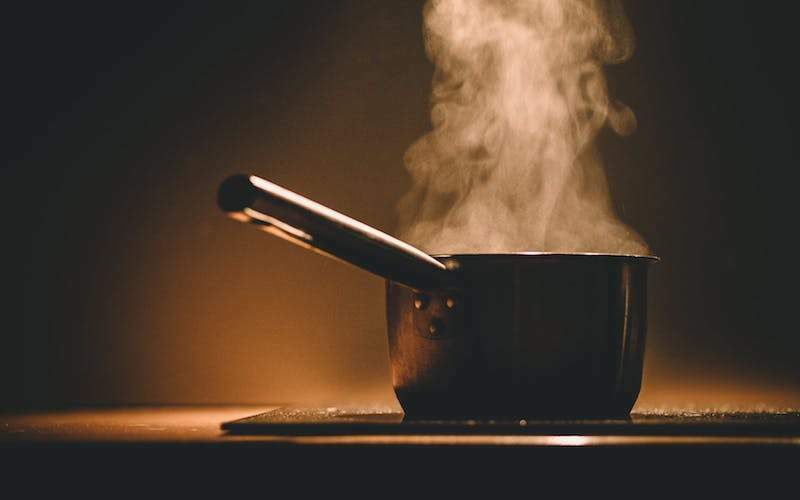 When the water comes to a boil, let it boil for at least two minutes. Remove the kettle or the pan from the stove. Hold the mesh strainer above the mug and pour the prepared coffee into the mug. There is no need to wait for the grounds to settle since you are using a strainer to catch any grounds that come out of the kettle or the pan. 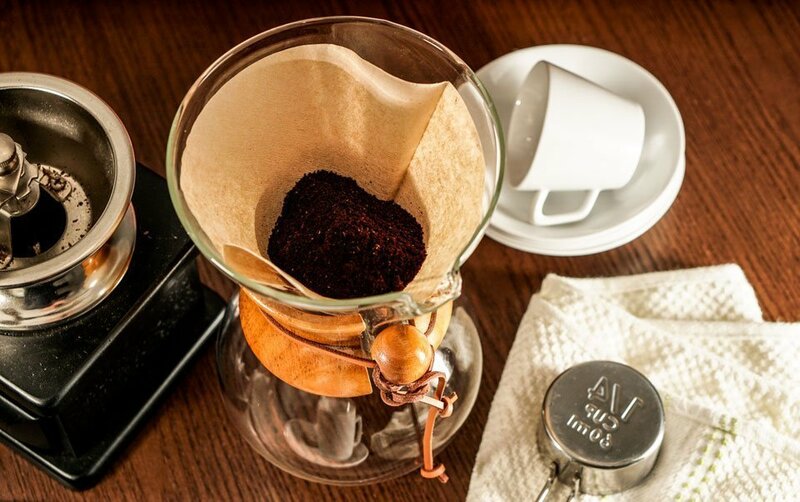 Did you know you could always make a small bag for your coffee grounds? Well, that’s what the French used to do back in the 18th century. That’s a great method for anyone who’s always on the go but can’t function without his or her morning coffee. Take one serving of coffee grounds and pour it into the filter. Make a coffee pouch by closing the filter tightly. Use an appropriate string to tie it so that you have enough of it to let it hang outside the cup. Use a pot, a kettle or a saucepan to heat the water. Place your beautiful creation (the coffee filter bag) into your mug. Pour the hot water over the bag, but don’t overfill the cup. Let your coffee steep for a while to have your brew weaker or stronger. Most people like to discard the filter before drinking their coffee. No, you don’t need to be a cowboy to prepare your coffee this way. The technique is named as such simply because it means that you can have your coffee just about anywhere. Take some coffee grounds (one tablespoon) per serving and put them into the kettle. Pour water (eight ounces) per serving. Use a spoon to mix it. Place the kettle or pot on the burner (or over the fire if you’re outdoors) and bring the mixture to a boil. Let it boil for two minutes before removing the pot from the stove. You need to let it sit for four minutes or so to let the grounds settle in at the bottom. Avoid the grounds from getting into your mug as you pour the coffee. But if you’re truly a cowboy, you wouldn’t mind them in your coffee. No string, no drip machine and nothing to waste. It never hurts to enjoy some quick and aromatic coffee by brewing it in the microwave. Just don’t make it a regular part of your daily routine! 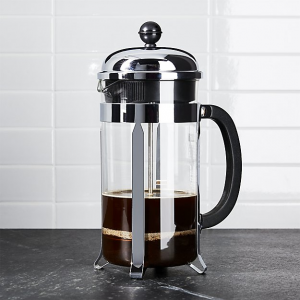 Another easy way to make heavenly coffee without a coffee maker is to use a reliable French Press. Contrary to popular belief, the French Press was actually invented by an Italian and not a Frenchman. Start by warming a pot of hot water. After pouring the water, put around eight tablespoons of coffee grounds into the pot. Now pour the hot water back into the pot and leave some room at the top. Make sure the water is not boiling hot. Mix this mixture of water and coffee and leave the pot to brew after putting the plunger on. After at least four minutes, lower the plunger slowly and go all the way down to reach the pot’s bottom. Pour and enjoy. You can also use percolators, which are convenient to find and are available at an affordable price. 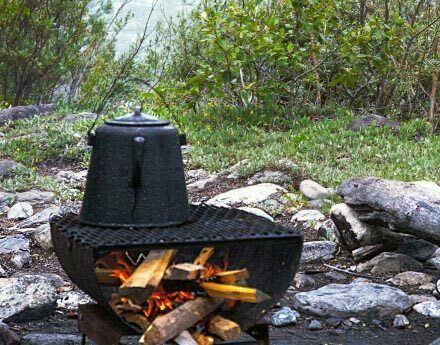 The best part is that you can use percolators on a camp stove or an electric stove. But when the power goes out for days after a heavy storm, a percolator is your trusty companion to give you your daily supply of coffee. Sometimes all you can do is make a cup of instant coffee to give your morning a much-needed boost. 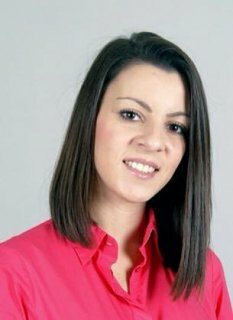 Despite its poor reputation and a bitter taste, most of us still prefer having instant coffee rather than skipping coffee altogether. It’s convenient and quick to make which is why this type of coffee has always been around. Remember to keep a good supply of instant coffee in your pantry to avoid any emergency trips to your local superstore. While it is not the most delicious coffee you will have, a cup of instant coffee is sure to stave off a migraine you’re going to endure if you skip your dose of caffeine. Don’t buy bags of pre-ground coffee. Always go for fresh whole beans. Since coffee gets its peak flavors just days after it has been roasted, it’s best to consume it within 30 days of its roast date. That’s why you can’t find a roasting date on most coffee labels. If the bean degasses, all the lovely oils start to oxidize, which reduces the flavor of the coffee beans. Although freshness is highly subjective, there are a few things you can do to retain the quality of your coffee so it remains strong for a long time. Check your local coffee shops to find the best and freshest coffee. Some shops even roast on the spot which adds more freshness to your coffee. Store your beans properly to keep their flavor strong and fresh. A mason jar or a vacuum sealed container offer great ways to store your coffee. When and how you grind also matters to get the perfect cup of coffee. Ideally, you should grind your coffee right before you are about to brew it to attain the maximum flavor. Experts believe that coffee is likely to lose some of its flavors within 30 minutes of being ground. So, it’s a great idea to grind your beans on the spot, before brewing a pot. We all want to turn our coffee beans into grinds we can use to brew the perfect cup of coffee. While most of us grind our coffee beans the usual way, you don’t want to compromise on the consistency of the grind to affect the quality of your coffee. There are various ways to crush and grind your coffee beans. The key is to make sure the beans are sufficiently grounded without turning them to dust. When you don’t have a coffee grinder, turn to your handy blender to do the job. But it may be a little trickier than it sounds. Since blenders need some liquid to help move around the contents, you may wonder how you can get a medium grind with this appliance. The first thing to check is whether your blender comes with a grind setting. But there’s nothing to worry about even if it doesn’t have one. Just add a small number of beans and grind them to a good consistency with short bursts of power. Remove and take another small serving to grind more coffee beans. Although the process will take some time, smaller amounts will prevent your blades from getting stuck or damaged. If you blend coffee beans in large amounts, you not only get inconsistent grinds, but you will also damage your blender’s motor. Although this method is still pretty old school, there’s a chance that you have a mortar and pestle somewhere in your kitchen. When using a mortar and pestle, make sure you don’t crush your coffee beans to dust. You need just two tablespoons of grinds for every cup you are brewing. But you can add as many beans as you require if they easily fit into your mortar. Crush the beans using the pestle and stir them up as you go. Just remember not to go overboard. We also know it as a meat hammer and serves as a small metal tool for softening cuts of meat. You can grind your coffee beans by pouring them into a zipper freezer bag. Seal the bag closed after pressing all the air out. It is a great idea to wrap the bag in a dish towel to prevent any punctures. You only need a little force to hammer the beans to get an even consistency. But make sure you check the consistency after every few wacks or you’ll end up destroying your precious coffee beans. If you use hard water, the minerals are not going to bond well with the dissolved residue from the coffee and produce under-extracted coffee. Moreover, mineral content also leads to a build-up of lime deposits. But distilled or filtered water can be just as destructive. Although it does not cause any build-up of minerals in your coffee, the lack of ions forces the water to extract minerals out of the metal components in your utensils. We all love coffee because it is loaded with antioxidants and serves as a great energy booster. For some people, a broken coffee maker means the end of the world. But, there are literally dozens of ways to prepare aromatic and delicious coffee without relying on an appliance or machine. The amount of water you use is another overlooked element of brewing perfect coffee. Now that you know how to make coffee even when you don’t have the best coffee maker, make sure you pick the best coffee beans and store them the right way to preserve their freshness. Whether you order your coffee online or hand-pick a product at the store, remember to buy delicious smelling coffee beans to brew a perfect cup of coffee. Try out any of the above-mentioned methods to enjoy your daily dose of coffee.